Now that I’ve completed the Assembly version of this little game, I want to contrast the required Assembly source with the equivalent BASIC source. For those that don’t know, BASIC is a simplified computer language that uses an English like syntax. The word BASIC stands for Beginners All-purpose Symbolic Instruction Code. On the Atari 8 bit it is an interpreted language, meaning your program source does not compile down into machine opcode instructions. Rather the BASIC program itself executes each line of a programs source code on the fly when its run (interpreted). BASIC often was, and perhaps still is in some cases, the first language a new programmer learns. It was designed to be easy to use, and it was included with many (now) vintage computers. Often these computers booted straight into BASIC if no other programs were present – as was the case with the Atari 8 bits. Today there is debate surrounding BASIC’s relevance. From my point of view, BASIC and Assembly may as well be complete opposites. First the Assembly source code (in Mac/65 Assembly) for Number Guess, as presented in the last post. 10    .TITLE "Guess Number, Version 1.0"
0534 ; Print it and ? 0850 ; Guess max reached? I crated two versions. The first version follows the same flow format and line numbering for an easy comparison. The second is shorter version without the same flow restrictions imposed. 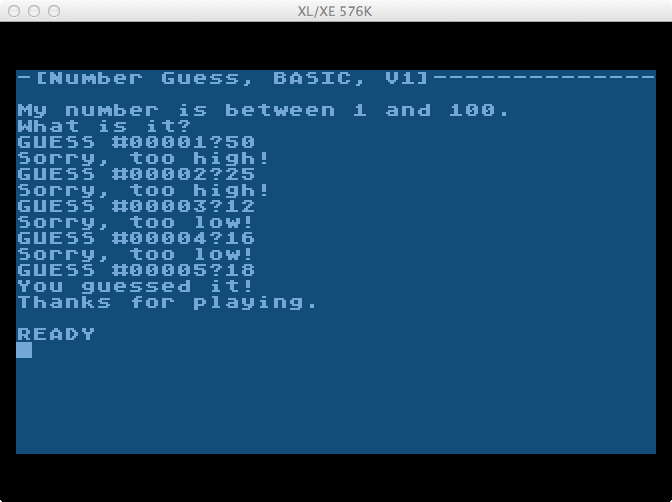 Both BASIC versions of Number Guess are in Atari BASIC. This is version that emulates the assembly program flow and line numbers to make an easy comparison. Any line number here can be matched up to the same line in the Assembly source above. The Assembly version will generally require more steps (lines) to do the same thing. 330 ? CHR$(125);"-[Number Guess, BASIC, V1]--------------"
350 ? "My number is between 1 and 100." 360 ? "What is it?" 1020 ? "Sorry, too low!" 1120 ? "Sorry, too high!" 1220 ? "You guessed it!" 1915 ? "Thanks for playing." This one is shorter and more streamlined. It could also be improved on a lot further, but it gives you an idea. 105 ? CHR$(125);"-[Number Guess, BASIC, V2]--------------"
110 ? "My number is between 1 and 100." 115 ? "What is it?" 300 IF IGUESSMYNUM THEN ? "Sorry, too high!" 400 ? "Thanks for playing." See, BASIC does a lot of work for you! But at the cost of speed and the fact that BASIC must be loaded in some form before your program can be executed. With Assembly programs they can be run without any other programs (or interpreters) loaded first, which makes more memory available to your program. As you can see they are basic-ally the same. 😉 The only real difference with the BASIC versions is there is not a space after the “?” when the user inputs the guess. Now I put the library of Assembly routines to work. 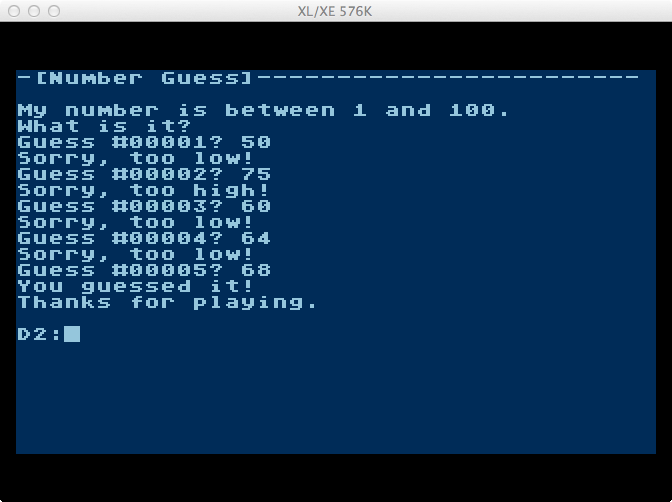 I created a small game which is an implementation of “Guess My Number”. Hey, you gotta start somewhere. In the previous post I detailed the library, so I’ll jump right into the game. A random number is generated between 1 and 100. The current guess number is displayed, and the user is asked to make a guess. If the guess is too high, a “too high” message is printed, the guess number is incremented, and step 2 is repeated. If the guess is too low, a “too low” message is printed, the guess number is incremented, and step 2 is repeated. If the guess is the random number, a “got it” message is printed followed by a “thanks” message and the game exits. CLD – CLear Decimal flag. Instructs the 6502 that plain binary numbers should be used rather than binary coded decimal (BCD). AND – logical AND. Performs AND on the accumulator contents with the contents of the specified value or location with the result stored in the accumulator. BCC – Branch if Carry Clear. Branches to specified location if the Carry flag is clear. Can only be +127 or -128 bytes of branch address. This is the Mac/65 Assembly source code. The source may work with other macro capable assemblers with or without slight modifications. 10 to 15: Assembler directives use to control object output and printing. 25 to 30: Include the source for the A8 library definitions file, and the A8 library string macros. 306: Clear the decimal flag since we need plain binary numbers, not binary coded decimal. 310 to 314: Set the left margin to column 0. 350 to 356: Print the statement about the number range. 406 to 410: Store the number into VMYNUM. 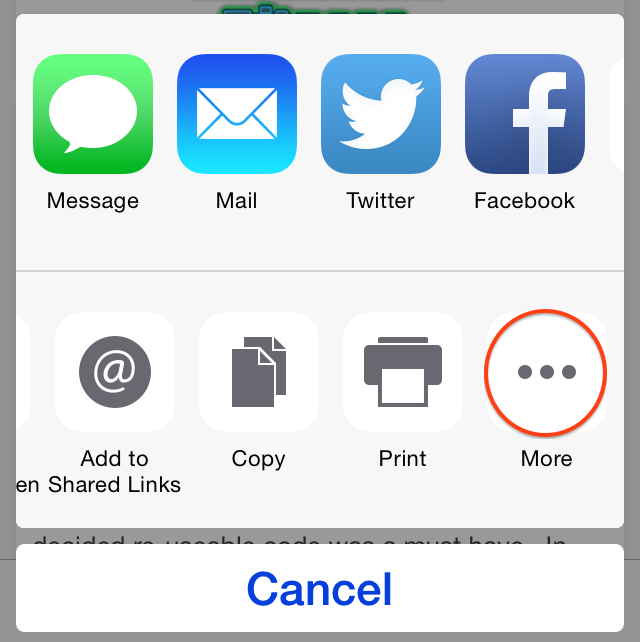 If you have iOS8 on your iPhone or iPad, you use 1Password, and you are tired of doing a two app copy/paste shuffle with Safari and 1Password, then this post is for you. 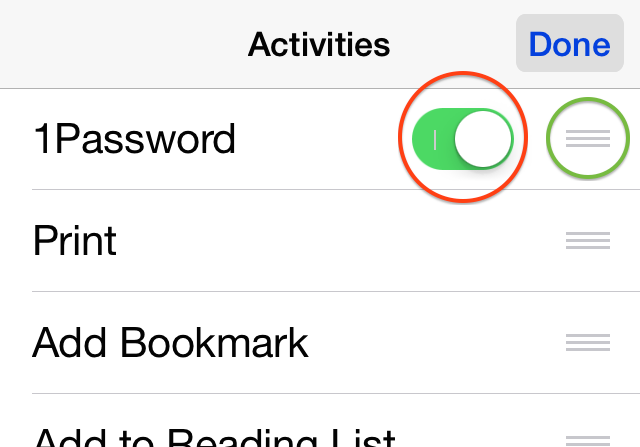 Until iOS 8 it was not possible for 1Password to integrate with Safari. You could use 1Passwords built in browser when visiting sites requiring authentication, but it’s not quite as fast or robust as Safari. Declining that you are left with having to shuffle between Safari and 1Password using copy and paste twice each, once for the user, once for the password to perform a login. You could also just leave yourself logged in, but thats a big security no-no and opens your account to all kinds of mischief. iOS 8 introduced a new feature called Active Extensions which lets Safari hook into other applications. 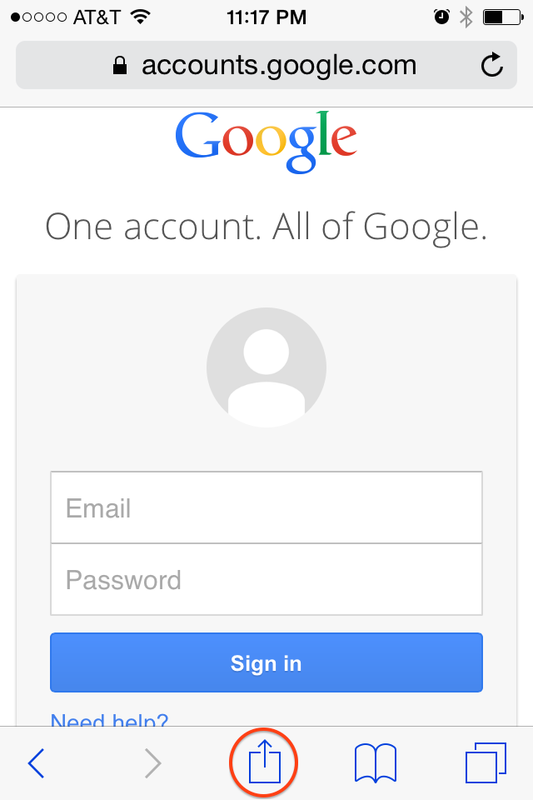 Ideal for 1Password. This is how you enable it. 2. Tap the Action menu icon at the bottom. 3. Scroll the bottom gray section to the right until you see more, then tap it. 4. 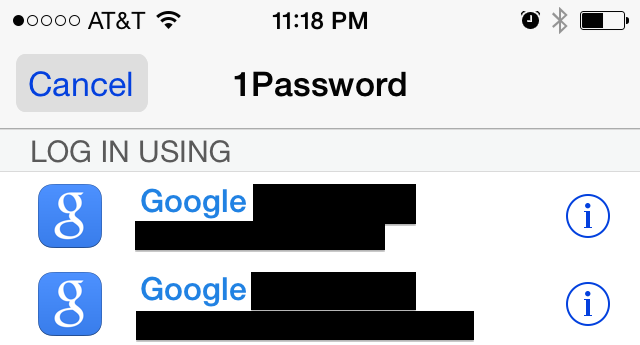 Find 1Password in the list, likely at the bottom, and turn it on (see red circle). While your in there move it to the top of the list using the reorder control (green circle). Then Tap “Done” at the top. That’s it! It is now setup. 1. 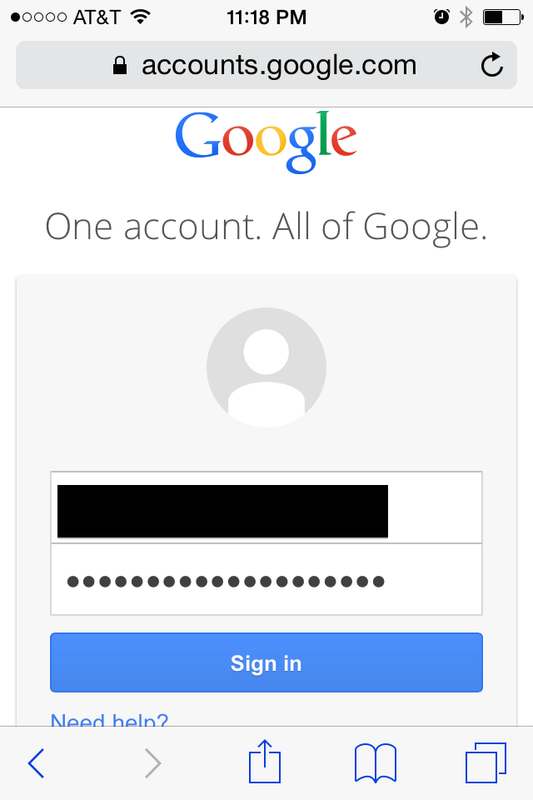 Open a web page that requires authentication such as Google mail. Then tap the Action menu icon. 2. Tap the 1Password button. 3. 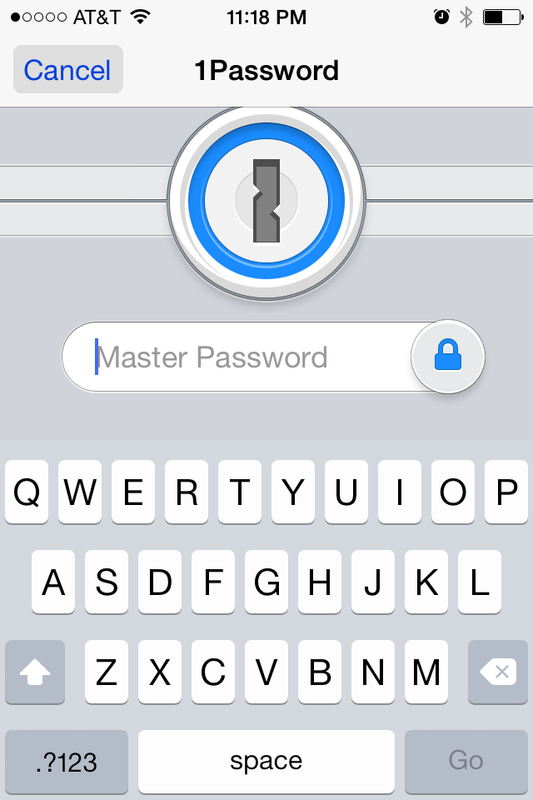 1Password is launched in context. Login to it. 4. 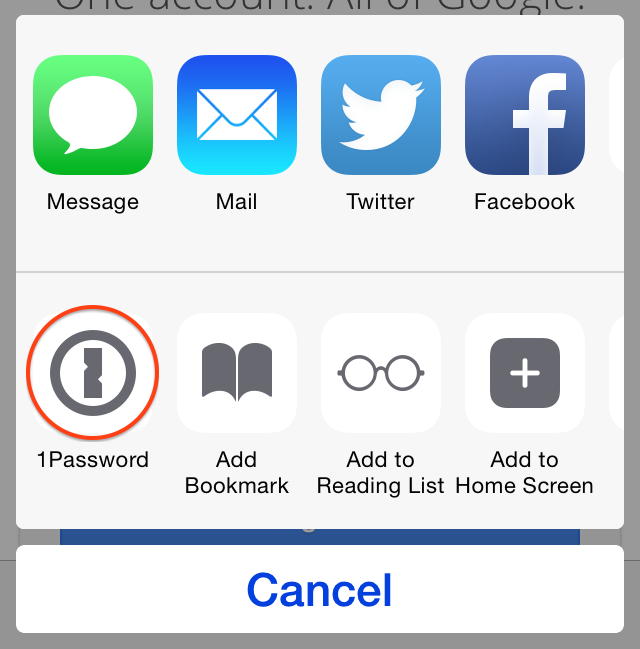 1Password will sense the web site you are on just like it does on the Mac, PC, or using its built in browser. If more than one account matches you will be asked which one to use. Just tap it. 5. 1Password will fill the username and password fields for you, then exit. 6. Now just tap the sign in button.